There are wonderful ideas for throwing your kid an awesome birthday party on the internet. Unfortunately, some of the writers of these ideas either never had a child, or never threw their kid a birthday party. As with everything in a parents universe, a party is only fun if it is functional. If you have to use phrases like “Don’t touch that!” or “Here, let me reach that for you.” you are either a glutton for punishment or you have missed the mark. Your child's birthday party is for your child. It is designed for a child's skill level. It should be cute and fun, but not to impress the adults. With that in mind, we are going to give you some ideas that will let you be the envy of other parents and make your child feel like he is king for a day. If you want a party that thrills the kids, and is easy for you to set up, and clean up, get rid of the cake and put up a candy buffet. Select two or three colors to use, and stay in those hues. Both boys and girls love blue so purchase bulk blue candy and add two colors to complement your theme. Do not set up your candy buffet on adult tables. This is a recipe for disaster. Children on step stools trying to reach inside jars of candy with tongs. Need I say more? Use low tables like activity tables, or place wood planks on lower steps of a step ladder on each side. Decorated, this is an awesome look. Buy individually wrapped candy so the kids can use their hands. Use plastic jars or vases or even children’s pails for candy holders. Have selections that are sugar-free, gluten free, and allergy friendly and mark them for parents. Do not set up your candy buffet in the sun. Use a patio umbrella for decor and to keep the sun off the candy. What is a “Best Party”? It is a party that keeps the kids busy and having fun and allows the adults to provide minimal supervision. Watching the kids wear themselves out while mom sips iced tea is a win-win in my book. So what can accomplish this elusive deed? Graffiti! No, we are not suggesting you hand your kids spray paint cans and drop them at a subway entrance. If your party is outside, hang chalk posters the length of the fence. 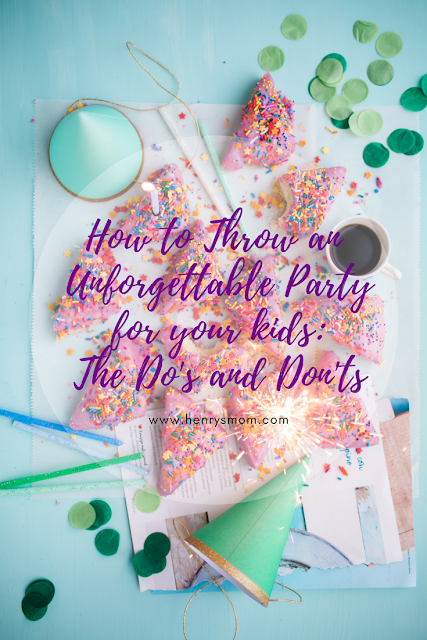 If you are having the party indoors you can use posters or easy peel and stick contact paper (it is easy to remove these from the walls) and provide a basket full of chalk markers. Chalk markers are bright and beautiful, easy to hold, and they do not make a mess. Let the kids use their imagination and design graffiti posters and leave birthday messages for your child. When the kids are ready to go home, you want each of them to take a bag full of candy with them. You can add an extra treat by using chalkboard gift bags or use paper bags with chalkboard stickers. Let them use the chalk markers to decorate their candy bag. This is a fun way to thank them for coming and unloading all the candy too. At the end of the day, your kid had a unique and fun day and all of his friends went home happy. Clean up is easy. Return leftover candy to the boxes and put away your candy table and you can let your child decide which posters he wants to put in his room. You can hold on to them and let him display one at a time if you want to. The best kids party is one they are actively involved with. That is what makes this party a winner. Let the kids be creative and you might be surprised at what they come up with. One thing for sure, it will be fun. And that is all that matters. Wendy is a super-connector with Sweet Services who helps businesses with building their audience online through outreach, partnerships, and networking. A happy mom herself, Wendy frequently writes about the family life, healthy habits, and parenting. I am clueless on setting up a candy buffet 😅. What I love most on themed party is D-I-Y decors that I enjoyed doing.